One of the best ways to cool off in the heat is with a milkshake. Whether you’re looking for an old-school malt shake for nostalgia, or a modern twist on the cold and creamy dessert, Oklahoma has the very best version of it. Here are 10 of the best places in Oklahoma to find one of those frozen concoctions to share with a friend or enjoy on your own! Braum’s make their milkshakes the old-fashioned way, hand dipped ice cream and fresh milk blended together as it is ordered. You can go with any flavor ice cream. Spoon University recommend strawberry cheesecake as its favorite in “The Best Milkshake in Every State in America,” but my favorite is cookies-n-cream. Sooner Dairy Lunch bills itself as the home of Norman’s best burgers and milkshakes, and OK Gazette readers agree that the milkshakes are awesome. You’ll find the regular flavors, strawberry, chocolate and vanilla, but you’ll also find some delicious specialty flavors like Reese’s, strawberry banana and butterscotch. Tucker’s doesn’t have a wide variety of flavors, but the shakes are made fresh to order and they taste great. You will usually find one specialty flavor, plus vanilla, chocolate and strawberry. Mod’s makes their milkshakes with their homemade gelato, which is quite an experience. Imagine a watermelon-mango or strawberry-pear shake. Candy Castle has an old-fashioned soda fountain inside the store. They’ll make your milkshake to order, just like in the good old days. This diner is best known for the trains that circle the restaurant as you eat, but you can also find hand-dipped shakes and malts from the soda fountain. They’re already delicious, but the ambiance makes it even more fun. You can find delicious milkshakes made with Breyer’s ice cream at this iconic burger joint. If you’ve never been to Eskimo Joe’s, you should put it on your summer list. Don’t forget to get a t-shirt before you leave. Enso serves up an adult milkshake, made with Guinness and ice cream. They have some other yummy milk-based cocktails on their menu, if the Guinness shake isn’t available when you order. Custard is a frozen treat that is served a little warmer than regular ice cream and it has less air mixed into it, giving it a better flavor than ice cream. When you make it into a shake, it’s absolutely delish. Kong’s serves up adult milkshakes, like a Dreamsicle, made with orange sherbet, clementine Svedka, white chocolate chips, cheesecake bites, fruit popsicle, rainbow sprinkles, nerds and whipped cream. 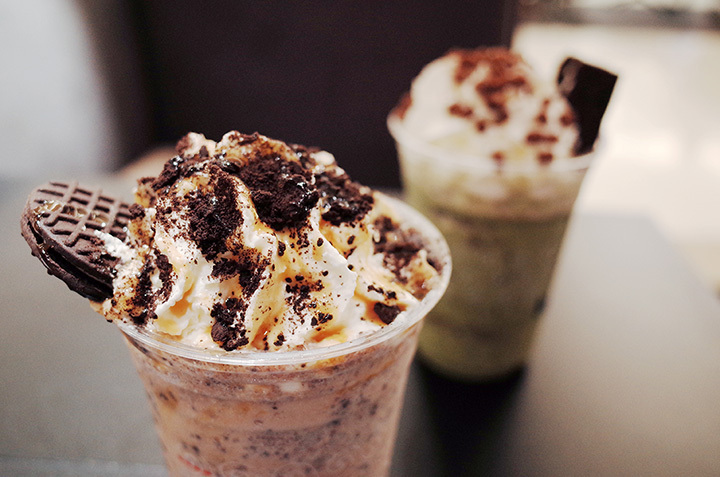 The Cookies and Cream has bourbon, vanilla milkshake, Oreo crumbles, chocolate Rice Krispies and whipped cream.